Sorry its taken a long time to announce this but there was a lot of money to count! It gives us great pleasure to announce the stunning grand total raised by the row4Sam in September. The grand total is £4111! So here it is, the next totaliser. This wad of money brings our grand total raised for Sam since December 2005 to £27,338! Blimey! Remember that every penny of the money we raise goes to Sam to buy cool kit to stimulate and help him develop. We hope to have some news soon about the next bit of stuff that has been bought. Four men in a boat make it on to dry land! We all went down to the Dukes Head, Putney Bridge to welcome Toby, Edward, James and Alister back from their epic five day row from Lechlade in the Cotsworlds to Putney London. Looking quite the pro’s in their Stuff4Sam T-shirts we heard a few of their tales from the trip. They met a lot of people along the way who gave them places to stay as well as donated to Stuff4Sam, well over £100 was collected along the way. It wasn’t all beer and skittles though as they batttled through rainy and windy weather conditions at the start of last week and were literally rowing against winds forcing them back upstream. Aside from an eventful trip Saturday was not without adventure itself. The spring tides were out in force and it wasn’t long after parking outside the pub that we noticed the river spill over onto the road and start flooding. One of our friends Chris just managed to move his just in time (he’s always wanted an amphibious vehical) after having had to wade though water to get to it. 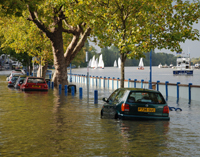 Others were not so lucky as their cars got flooded and bopped in the water as the pictures below show. So a huge thank you to Toby, Edward, James and Alister for not just the fundraising but also spreading the word. We’ll be posting the final amount raised soon so don’t forget to come back to teh site and check. The four men in their boat should soon be nearing the end of their epic journey if their predictions are anything to go by. They said that they would be at Putney at 7pm tonight. We have not heard anything but hope that they are faring well. It must be hard to text with cold blistered fingers. We hope there is a stiff drink waiting for them at the end to warm them up! Thanks to everyone who has supported them by making a donation to stuff4sam. We’ll be counting everything up and making an annoucement about how much their adventure has raised when they are back on dry land. There’s a strong possibility we’ll have to dust off our old friend the totaliser! If you haven’t made a donation and plan to do so, what are you waiting for? Its easy via PayPal! Just click on the ‘Make a Donation’ button in the left-hand column! My old friends ‘four men in a boat’ launched their epic journey down the Thames on Sunday. The great ‘Four Men in a Boat’ journey has begun! Toby, Kip, Eg and Brig launched out from Lechlade-on-Thames in Gloucestershire early Sunday morning and Sam was there to see them off. They are now making there way effortlessly down the Thames at a frightening speed, flying the ‘Hi Sam’ flag. Complete with camping gear, lots of food and a copious amout of drink they are spending their nights on the shore and in the boat, and days straining their muscles… all raising money for Sam. As they set sail, we saw them in the distance taking their first evenish strokes and Sam saw them disappear from view. Even though Sam didn’t say very much at the launch, he talked non-stop about it in the car and is now keen on going in the water himself! Please give them a wave if you see them on the Thames over the next week. We all very much appeciative of them and everyone taking their holiday time to raise money for Sam’s equipment. Behind the scenes we are investigating some pieces of equipment that would have huge rehabilitation benefits for Sam. The company that produces the FES bicycle are producing an upper body arm cycling FES machine that would be incredibly benefical for Sam’s upper body. 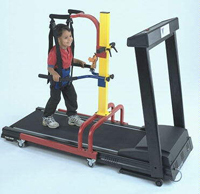 There is also a partial body weight supported walking treadmill that would enable Sam’s legs to be propelled by two assitants over a treadmill to simulate walking and produce a natural gait pattern. There is even new research into vibrating plates that could be used with Sam’s standing frame to maximise his time in the frame and increase his bone density etc. On a different front we are looking into a bicycle that could have Sam’s wheelchair attached to the front – so it could mean we start entering some cycle races with Hugh! So we are making sure what the best thing would be for Sam so that the money is spent wisely and doing Sam as much benefit as can be. We are all incredibly thankful that friends and stangers have come to help Sam. Being completely paralysed below the neck and being on a ventilator, his life has health and meaning because of the equipment you have helped provide. We are thankful that more people have come to help Sam than we could ever have expected – and that helps us keep Sam strong. With our thanks to you all. “Thank you to everyone that has pledged sponsorship so far – it is much appreciated. We will post a final total in due course, but it is looking good. We are nearly ready for the off. We will be leaving Lechlade Boatyard, Gloucestershire at 10.30am on Sunday 23 September and are planning to arrive in Putney early evening on Thursday 27 September. It is hoped that Sam will be coming down to the start to send us on our way. On Saturday 29, we will be in the Dukes Head, Putney Bridge from 1pm onwards toasting the trip! Please do drop in if you are in the area. 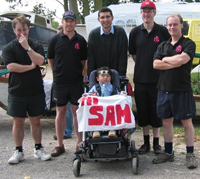 Toby and Edward Roe, Alister Rayner and James Brigden will be rowing down the Thames in September to raise money for Sam. 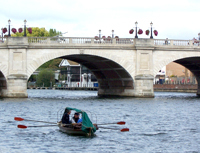 The four, who are friends of Sam’s Dad Neil, will be setting off in a traditional Thames skiff from the source of the Thames, near Lechlade in Gloucestershire and rowing to the start of the Boat Race at Putney Bridge, a distance of approximately 150 miles. 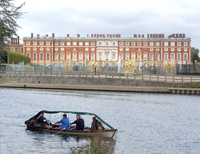 “None of us have any rowing experience apart from the odd jaunt on the Serpentine and so we thought this would be a suitable challenge to take on and raise lots of money for Sam. We are all training in the gym and will be doing some practice rows on the Thames in the next few weeks, with the focus on not colliding with the riverbank or other boats!” said Toby. 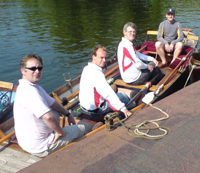 The ‘four men in a boat’ will be leaving Lechlade on Sunday 23 September 2007 and aim to complete the journey by Friday 28 September. Updates on the training and the trip will be posted in due course. You can sponsor them by making a donation via Paypal, just click on the make a donation button on the left. Or you can send a cheque made payable to stuff4sam to PO Box 54662, London, N16 8YG. 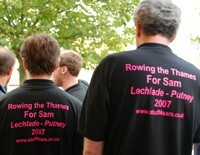 Please mention row4sam on your donation so that we can calculate how much the event has raised.